Every summer Ben Verdery comes to Maui to give his classical guitar masterclass. You have to audition to get in. The final concert is free to the public. “Are you going to the concert tonight?” asked my colleague who lives in South Maui. “What concert?” It was a Wednesday, too early for the Saturday 10 August concert upcountry. Usually I’m the first to hear about a classical music concert on Maui. The name needs no further explanation. When I first searched for “classical guitar” on Maui, as early as 2007, when I visited with Robert Bekkers to give our piano guitar duo concert at Makawao Union Church, I found the classical guitarist from Yale University who had been visiting Maui every single summer. Summer is when I leave Maui for the rest of the world — all except last summer and this. I had completely forgotten about my quest for Mr Verdery. I walked quickly to my office, worried that I might have missed the opportunity to finally meet the maestro. I searched online and only managed to find out about the 23rd July 2013 concert of Ben Verdery and his teacher, the composer and guitarist Frederic Hand at the Makawao Union Church. I wrote to John Olson to find details of Wednesday 31st July concert and immediately compiled a short invitation to send to 602 of my colleagues and students, everyone who had subscribed to an internal mailing list. This concert was not advertised. It was a public performance of all 19 students who had auditioned and gotten accepted to the week-long program taught by Mr Verdery and associates, the 14th year since it began as an annual event — a well-kept secret, I concluded. The famous church next to the Pacific Ocean, at the southern most tip of Maui’s beaches — Makena, as the area is called, has excellent acoustics. I had attended two concerts previously and firmly believe that it should be a permanent place for live classical music. That evening, I saw the guitarists warming up outdoors, on the church grounds around sunset. Various sized shoes were lined up outside the entrance, an invitation for me to take off mine. The polished wooden floors looked and felt clean and shiny — “let’s keep it that way,” I whispered to myself. There was an atmosphere of familiarity and comfort, as though the parents, friends, and families of the guitar students had sat and watched the “guitar summer school” take place all week. It was not difficult to spot Mr Verdery, for he seemed the most relaxed of all. The audience were not the only ones that decided to go barefoot. Every guitarist on stage, the composer / conductors, and Mr Verdery himself had bared their feet. [Note: I had tried to get everyone who performed and came to our house concerts in Utrecht, Netherlands to take off their shoes — but some people simply refused to!] There was a kind of nakedness and intimacy as well as respect for the owners and property when we sat without our shoes. Later I realized that barefoot was necessary to prevent unnecessary noise. The guitar is a soft instrument after all. The entire masterclass, who called themselves the Maui Honu Guitar Orchestra, opened the evening with a piece composed and conducted by Oahu-based Ian O’Sullivan. Now teaching at UH Manoa, Ian O’Sullivan had studied with Mr Verdery as a summer student on Maui before winning a full scholarship to Yale for his Master’s Degree. The title of this guitar ensemble work, Waialua, is the name of an area in the famous north shore of Oahu. The piece is classical music with a Hawaiian feel. I would love to hear it again! Thereafter, guitarists appeared on stage two or three at a time, taking their turn performing solo guitar pieces of Piazzolla, Dowland, Pujol, Koshkin, Powell, Domeniconi, Villa-Lobos, Hand, and others. Everyone, except the Pacific Ocean through the open doors and windows, quieted down for this guitar concert. This togetherness in silent attention reminded me of another occasion, the Katona Twins in Warmond, Netherlands. You really have to know guitar to know your manners — no rustling of the programme notes, whispering, or other movements that create unnecessary noise. You could literally feel everyone’s concentration at hearing every single note. Once upon a time, I heard guitar music every single day. Nowadays, I hear it via Facetime, telephone, CD, or radio. Thus it was a very special evening to hear 13 solo guitar pieces, 3 guitar duets, and 3 guitar ensemble works. It brought back memories of just how intimate guitar music is. The last piece deserved an encore. Mr Verdery introduced “Start Now” as a piece originally for duo and then trio and then quartet. Towards the end, out of the blue, Mr Verdery whipped out a harmonica and joined the ensemble. It’s a piece you could tap to, dance to, and feel one with the music. Encore! On Sunday 19th September 2010, we classical musicians will once again compete with the famous “Dam to Dam.” I say we will compete WITH not compete IN this “Dam tot Dam” because we are competing for the attention of the audience and the logistics of getting to the church on time. 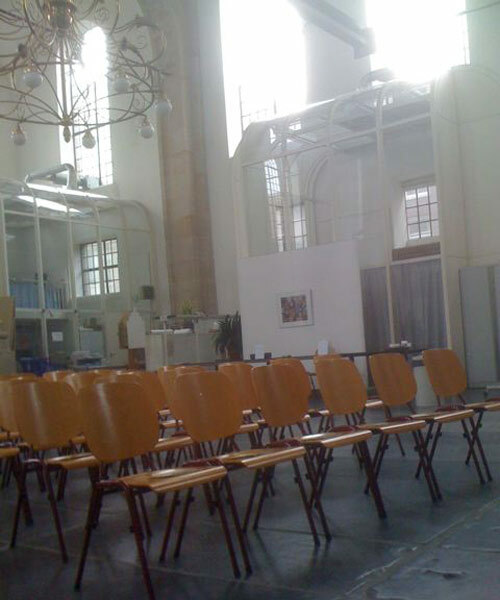 The Oosterkerk, like other central attractions, will not be reachable by private car or bus. Thus it’s vitally important that anyone what wants to attend our concerts know just how to get to these two concert venues with respect to the marathon. I say we will compete WITH not compete IN this “Dam tot Dam” because we are competing for the attention of the audience and the logistics of getting to the church on time. The Oosterkerk, like other central attractions, will not be reachable by private car or bus. The main roads will be closed to traffic to allow the 10 English Mile, the 4-English Mile, and the mini Dam tot Dam. We were being paid a flat fee so it did not matter how many people came. The concert itself, like this year’s, was entirely FREE to the public. Unaware of this marathon, we arrived to a deserted Amsterdam that Sunday morning. We got off at Muiderport station and walked a good 15 minutes with our costumes, guitar, music stand, and music scores. It was all quiet on the eastern front (oost means east in Dutch). There was enough space for several hundred. Only 20 people came to the free concert. We wondered how the Funen Concert at nearby Funen Park 125 (also on the east of central Amsterdam) fared at 15:00. This year, I will be giving a concert with French horn player Emile Kaper at 15:00 i.e. AFTER the Bekkers Piano Guitar Duo concert. 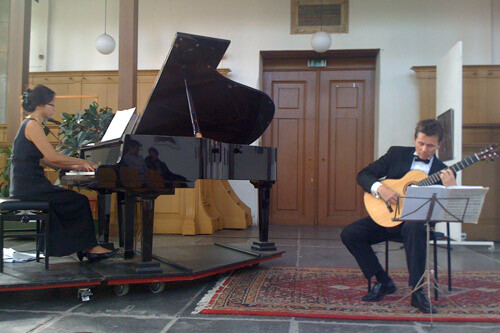 Unlike the Oosterkerk concert, the Funen Concert pays the musicians based on a percentage of total revenue. This year it’s 10 euros per ticket at entry. The maximum capacity is 40. Reservations are not required but requested. Thus it’s vitally important that anyone what wants to attend our concerts know just how to get to these two concert venues with respect to the marathon. The sound of the organ lured us in. Usually we never get to see the organist in action. Here with the organ in front of us, we could see and hear him. Every morning in Florence, I wake up to the sound of church bells. It was the same in Venice a week earlier. I just need to count the number of rings to know the time. They never seem to ring when I’m deep asleep. I made a short recording to remember the sound, just before breakfast with my mom. On this warm Sunday morning in November, I took a detour and led my mother to the church of a nearby monastery. 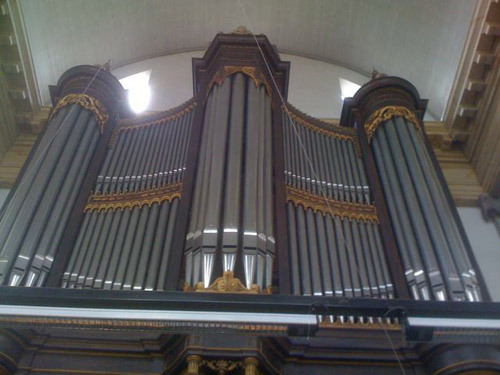 The sound of the organ lured us in. A young nun stood at the entrance handing out programme sheets entitled “Solennita di Tutti i Santi.” On one side of the church kneeled two rows of nuns. On the other side kneeled monks. As I had never been to a church service with nuns and monks, I was curious if this was a Latin Mass, i.e. with Gregorian chants. The Santa Maria Assunta church of the “Fraternita Monastiche di Gerusalemme” gradually filled up as time passed. The pure sound of men and women contrasted greatly against the tenor and baritone duo at the Latin Mass we had attended the previous Sunday at San Simeon Piccolo in Venice. I felt somewhat guilty that it was the music that caused me to stay for the service. The same evening we arrived early for a concert of countertenor, oboe, and organ at the Chiesa Santa Maria de’ Ricci via Del Corso. The countertenor opened with Pergolesi’s Salve Regina, soaring to heaven. I explained to my mom that it’s rare to hear countertenors. Indeed it was her first time. After the countertenor, the oboist played a piece of Corelli. I couldn’t find the correct Chinese word for the instrument or explain the details to my mother. It was exciting to see the organist and his 12 digits (fingers and feet) playing one of my favourite pieces, Bach’s Toccata and Fugue in D minor. The countertenor assisted him by turning pages and switching the registers. Usually we never get to see the organist in action. Here with the organ in front of us, we could see and hear him. The church was only 25% full, despite the freebie. After the concert, the church custodian brought out CDs for sale. At 15 euros per CD for an unfamiliar group of musicians, I thought it was pricey. But for a free concert, to support the musicians, I was happy to pay for it. While listening to the 50-minute CD, a live recording of flute, countertenor, and organ, I learned that the association was formed in the late 80’s and the music school since 1990. The Giovani Musicisti Fiorentini offers free concerts of mainly Baroque music on organ, flute, oboe, and often with voice such as soprano and countertenor. Apparently they provide free live music every single day of the year.